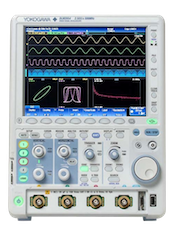 The true noise floor of a Yokogawa oscilloscope is ≤ 2-3mVpp. The DL9000, for example, has approximately 280uV residual noise at 2mV/Div with input termination set to 50Ω. If the attenuation ratio is not kept at 1:1, the residual noise level is multiplied by whatever attenuation factor you have set. A 10:1 passive probe has a 10:1 attenuation ratio which means that the probe divides the signal by a factor of 10 before it is introduced to the scope. The scope will compensate for this attenuation by multiplying the input signal by a factor of 10. Therefore, if the attenuation ratio is set to 10:1 using a 10:1 probe, you can expect the residual noise level to increase by a factor of 10, i.e. 2mVpp at 1:1 attenuation will be 20mVpp at 10:1 attenuation. Please keep in mind that the residual noise level will vary with the V/DIV setting. When comparing two scopes, make sure that both scopes have the same setup in terms of attenuation factor and V/DIV. For applications in which it may be necessary to compare noise with input ground (input coupling = GND), please use the 1:1 attenuation ratio setting. If your application is evaluating power supply noise, consider using a differential probe for better accuracy. A passive probe set at 1:1 may also be possible, depending on the accuracy of the measurement you are making, but keep the ground leads short to avoid additional noise. Remember that probes, environment related, and the DUT itself will introduce additional noise. Please take the necessary precautions to prevent these additional noise sources. You may manage some of these noise sources through the use of Hi-Res mode, LP Filters, and /G2 User-Defined Math filters.